Getting students to pay attention in class isn’t always an easy task. So nowadays, you’ll find teachers trying to reach kids by incorporating things they can relate to, like Migos. 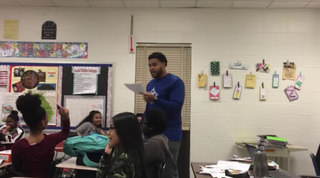 David Yancey, a history teacher at a Georgia middle school, used Migos’ popular “Bad and Boujee” song to help his students learn about the Civil War. And in Yancey’s “Mad and Losing” Civil War history lesson, the students definitely got into it. “My troops are mad and losing (bad)/Slowing them down is a doozy (man)/My soldiers are ready and ruthless (roar)/We got rifles and ironclads too (pow),” Yancey rapped as one of the students served as his hype man. In an interview with Complex, Yancey explained how he builds a rapport with his students and incorporates what they like. “Too often, teachers just tell students to learn things because we say so, but instead, we need to meet them where they are. I ask the students the song that the kids are into and I adjust the content to match,” he explained. Yancey definitely deserves a “bad and boujee” round of applause for finding ways to keep his students’ interested.